Livio AI, from Starkey Hearing Technologies, doesn't just help you hear more clearly – it also tracks your steps, streams music and calls, and translates 27 languages. The hearing aid features Starkey's proprietary Hearing Reality technology, which manages and separates layers of sound to replicate 'normal' hearing. It's impressive – especially in loud, noisy venues. That's not all, though – Livio AI also contains an accelerometer and gyroscope, and because it's attached to your head (either behind your ear or inside the ear canal) rather than your wrist, it's a remarkably accurate activity tracker. 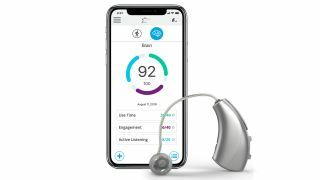 The hearing aid connects to a companion app called Thrive (available for iOS and Android), which monitors physical and mental fitness to reduce risks associated with hearing loss, including anxiety and social isolation. Each day, Thrive gives you three scores: body, brain and wellness. The body score is a based on the number of steps you've taken, how long you've spent being doing some form of exercise, and how much time you've spent awake and moving generally. The brain score shows the benefits of wearing a hearing aid, and factors in how long you've been wearing it, actively listening, and engaging with other people. The app combines this with your body score to grade your overall wellness. Livio AI also supports GPS tagging, enabling it to switch modes automatically in different places, and can stream media via Bluetooth. Hearing loss can affect every aspect of life, so this holistic approach makes good sense – and because much of the hearing aid's functionality is app-based, it can be easily upgraded with new features in the future. Schedule an appointment to find your local hearing professional and learn more.